We’re in the process of re-writing our tile maintenance brochure and would love to have your input. In addition to what we’ve described here about routine maintenance, sealers and repairs, what else would you like to know? Remove soil with a broom, dust mop or vacuum. Damp mop or spot clean as needed, using CLEAN, warm water or water and a pH neutral tile cleaner. Avoid all products containing bleach or acids, as they can weaken the grout (opening the pores & causing grout to get dirtier more quickly). Always rinse thoroughly with CLEAN, warm water and allow to dry. 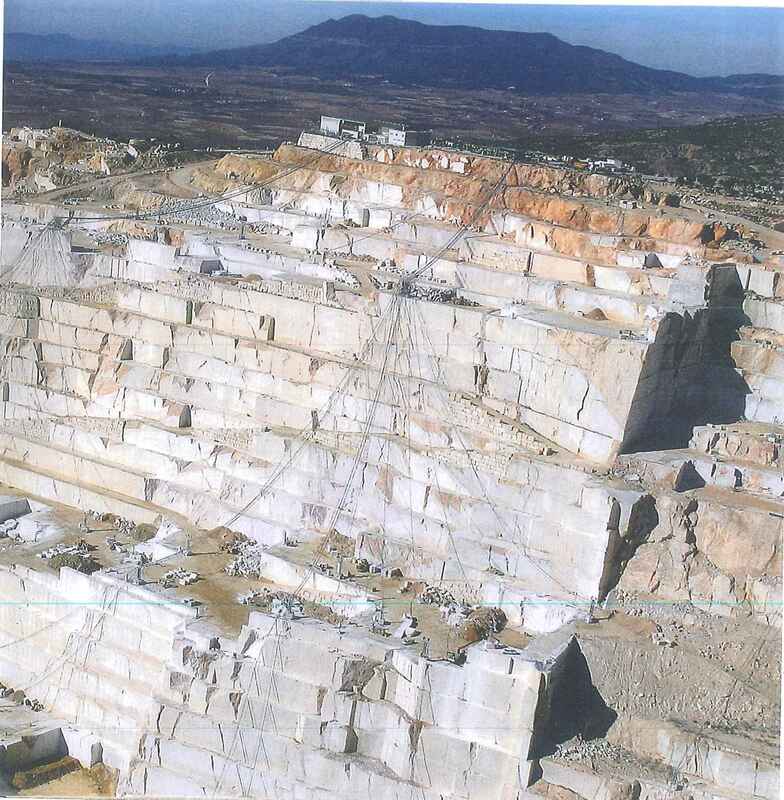 A second rinsing with clean water may be necessary to completely remove all cleaning solutions. When mopping, change rinse water often, preferably every 50 feet. Shower tile will look its best when you remove excess water with a squeegee after each use and when you run the exhaust fan for at least 20 minutes. Tile distributors sell cleaning products developed specifically for tile and stone which generally outperform products available in supermarkets. Use fiber or nylon scrubbing pads to help remove difficult stains; do not use steel wool pads. Grout care: For stubborn grout stains, agitate with a fiber or nylon scrubbing pad and a higher concentration of the recommended pH neutral grout cleaning solution. Over time, if the grout appearance becomes unacceptable, your tile distributor offers specialized products, including colored epoxy sealants which help restore grout’s appearance. Contact a tile service company or carefully follow manufacturer’s recommendations. Sealants: Many newer grouts have stain resistors already built in, so check with your tile installer about the brand used in your project. 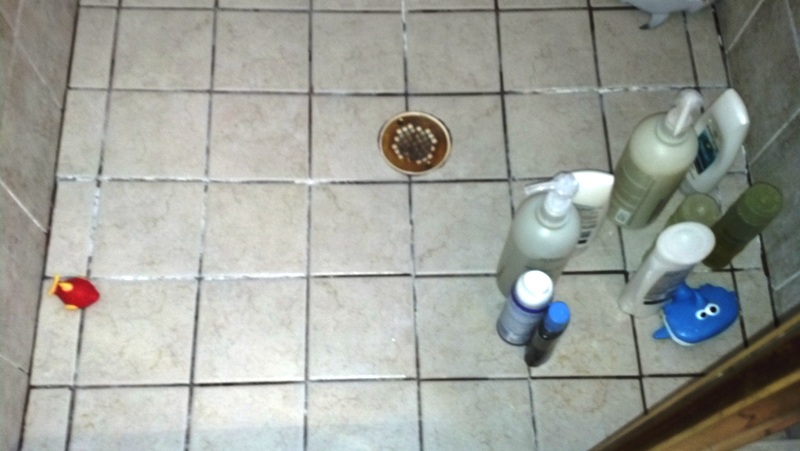 While not a part of base-level tile installations, sealers can be added to help keep stains from penetrating the grout. Sealers should be applied to cement-based grouts when the installation is thoroughly dry and after the initial grouting has cured for at least two weeks. Common Concerns: Clean up spills as soon as possible. Material left on your tile can be ground into the tile or grout, making clean-up more difficult. Ask your distributor or installer for specific information on your products because different materials require different cleaning regimens. Tile Repairs: The joint between the tub and tile wall and the counter-top and tile splash have the potential to separate with seasonal changes. As a house settles or the tub flexes, the grout in these joints may periodically crack. If this happens, remove the old grout with a sharp-pointed tool. (Be careful not to chip tile or tub.) Dry the joint thoroughly, and fill with silicone caulk available in tubes at hardware stores and in matching colors at most tile distributors. Broken or damaged tiles should be removed and replaced only by a reputable tile installer. Always test products in an inconspicuous area before treating the entire surface and be sure to protect surrounding non-tiled surfaces because some tile cleaning products can adversely affect metals, glass, wood, etc. Our website: www.NeuseTile.com has links to some of our preferred manufacturers. Categories: Ceramic tile, Tile cleaning, Tile Repair, Uncategorized | Tags: Grout sealant, repair tile | Permalink. A local resident called us last week to talk about replacing the shower bottom in his 1 ½ year-old home. He said he has a pan leak in his second-story shower, and, since his one-year warranty “is up” he is sure his original contractor won’t help him. We encouraged him to go back to his builder and strongly urge the contractor, his plumber, and his tile person to work together to resolve the issue. It may take some time and persuasion, but properly prepared tile showers are not supposed to leak after 1, 3, 5 or even 10 years! We’ve been doing business in the Triangle for a long time, and it used to be very rare to get a call about a shower pan leak. In the mid-90s we did start getting a lot of calls about tile falling off shower walls because one production builder had come to town and was adhering tile onto drywall in showers (it will start falling off in less than 2 years). However, even then, shower bottom leaks were uncommon. Now though, we get at least two calls a week from homeowners who have a water spot on the downstairs ceiling right below their master shower, or who have discovered rotten wood or water damage in their crawl space under a shower that’s been leaking for a while. Most of the time, these leaks are not in houses built in the 1970s, 1980s, or even the 1990s. These are very often houses built within the past 5-7 years. From the number we’ve torn out and re-done, we can tell you that most of the leaks are at the corners of the curb where the pan is not installed properly, from a nail that someone has driven through the edge of the shower pan (it takes about 5 years for the nail head to rust away and the water to work its way through that resulting hole) or from a seat or half-wall that was not properly wrapped with a waterproofing membrane. We could go on and on about how we feel about this kind of workmanship, and about what has happened to the construction industry in the past 10 years, and about why these problems are more prevalent, but the point is that there is a great deal of tile being installed in the Triangle area, and a good bit of it is being done in a way that will create future problems. It might look fine on the surface (there are some talented tile placers in our area), but that doesn’t mean there’s any subsurface integrity. We know that this will eventually cause a dislike of tile showers, but the real problem is lack of education: installers who just don’t know any better (or don’t care); builders who don’t understand the importance of hiring a quality tile subcontractor; and homeowners who wouldn’t know that there’s a future problem lurking under the beautiful surface. We support our industry’s efforts to educate tile installers, and we are doing better at getting more Certified Tile Installers in our area – that’s a great thing! However, we seem to be having difficulty educating the area’s construction industry. The recent recession put such pressure on builders’ profit margins, that they’ve cut every expenditure possible. Paying for knowledgeable, professional trades people has been a first place for many of them to cut back. And that’s probably why we get so many calls on leaking shower pans in relatively new homes. We could just embrace the faults of others and advertise our ability to fix mistakes of people who should know better. However, we really would prefer to raise the expectation of homeowners and contractors by encouraging them to ask about a tile installers’ credentials, expertise, and methods. You cannot hire someone in any construction trade based solely on price, and, in our business, you can’t even hire just based on photos of past work. You need to hire based on integrity: the integrity of an installer who is trained and Certified in the craft; the integrity of the installation materials being used properly, and the integrity of a company which will stand behind its work for years to come. Will it cost more to work with us than with the guy who put a magnetic sign on his truck yesterday? Yes. Insurance, taxes, training, staff, classes, marketing, and professionalism aren’t free, and we have to recover our costs so that we can stay in business. However, paying for your installation once (done the right way) will still be cheaper than paying a low price for it now and paying to re-do it in 5-7 years. Make your money count for the long-term! Categories: Ceramic tile, Installing tile and stone, Tile Repair, tile shower leak | Tags: Customer satisfaction, Five-Star Contractor, Installation expertise, Local tile expertise | Permalink. 15 years ago it seemed like a prank call when someone told us they had a problem with ‘grout worms’ in their shower, but now our service manager has taken a picture of what was likely lurking in the crevices of that shower and several others we’ve seen lately — tiny larvae that grow into little flies and thrive in the damp recesses of a well-used shower. 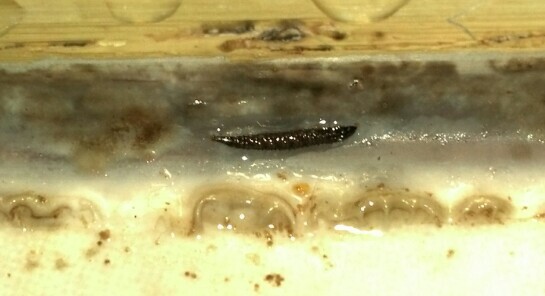 On the opposite extreme, we have also seen these larvae in over-cleaned grout lines. Each time bleach or some other overly harsh product is used, the pores of the grout open more, and mold and mildew are given an even better nesting place. This is why some people tell us that the more they clean, the more quickly mildew & other scum seems to develop. It’s because they are cleaning with a product that is too harsh for the grout, and they are actually eroding the cement in the grout. Categories: Ceramic tile, Tile cleaning, Tile Repair | Tags: Antimicrobial for tile, Clean ceramic tile naturally, Clean mildew on tile, Grout sealant | Permalink. Craftsmanship – out of style? Not to us. We are in the process of tearing out and re-doing a very nice couple’s steam shower. The tile work they had was horrific, the ‘waterproofing’ was non-existent, the framing was a joke, and the ‘finished’ product leaked all over their house. It wasn’t our work – it was the work of someone who claimed to be a ‘contractor’ and who has taken advantage of these unsuspecting homeowners. There’s no way this ’tile installer’ thought he was doing a sufficient job for these folks– he stuck cardboard in behind tile as a ‘filler’ in one area of the shower! Yet, he was recommended to this couple by a plumbing manufacturer, so they thought they were hiring someone who would do a good job. He didn’t; and he’s doing his best to give our industry a black eye. But, to this couple’s credit, they realize he is an exception, and they’ve maintained a positive attitude meeting their adversity by educating themselves. Before they signed on with us to tear out and re-tile their steam shower, they got references, researched the products we suggested, and even came by a steam shower installation in progress to see our guys at work. Good for them! When you’re not in the construction business, it’s hard to know where to start to find a reputable and experienced craftsman. Certainly, referrals are a good resource, as is doing some research on-line. Other valuable places to get information on potential contractors are their trade associations (ours is National Tile Contractors Association); a certification body (for us its Ceramic Tile Education Foundation); the local Home Builders Association; local business groups; and other people in similar fields. Your money and your home are too precious to entrust to someone who would stick tile to cardboard. We wish we had met this couple before their bad experience started, and we’re doing our best to create the steam shower they had in mind when this project started many months ago. In the meantime, we’ll keep reminding everyone how important it is to find a reputable and experienced contractor who will stand behind their work. (Longevity in the business DOES matter, especially in today’s economy.) If you have any suggestions on where else we should be spreading the word, feel free to share. Categories: Ceramic tile, Installing tile and stone, Tile installation expertise, Tile Repair | Tags: bathroom renovation, Installation expertise, Local tile expertise, low-cost tile, Plumbing leaks & tile, Quality tile install, Raleigh tile installer, shower pan leak, tile contractor, tile demolition, Tile standards | Permalink. A typical residential shower uses 2.5 gallons of water a minute. If you take a 12-minute shower once per day, that’s 30 gallons. Take those 30 gallons x 365 days a year x several family members, and you’ve had 5 times more water in your house than it rains in most places each year. So, for anyone with a shower, water management is an important issue. Both tile and plumbing can be part of that effective system. Obviously, most water that sprays from your shower head goes down the drain, but, because tile and stone are not waterproof, there is water that seeps through to the pan liner (a rubber membrane under the tile that directs water to the drain’s weep holes). — positive slope of the finished floor and the pre-slope below the membrane of at least 1/4″ per foot to the drain. Without positive slope, water won’t make its way to the weep holes, and that water can become septic causing odor and staining of the grout on the shower floor. In most of NC, the plumber installs the pan material, and some of our favorite plumbers have been going the extra mile for their customers to install a ‘pre-slope.’ Though it’s only a suggestion in the latest local building code, ‘pre-slope’ is the best way to ensure a shower floor meets the positive slope requirement and to cut down on the possibility for mold and mildew. There won’t be any low spots in your shower floor to hold water, and there’s less chance that any debris under the pan liner could make its way through the bottom and puncture your waterproofing membrane. A knowledgeable plumber will also ensure that your pan material is no less than 3 inches above the finished curb height and has absolutely NO nail holes or punctures in that rubber membrane. With properly installed plumbing preparation and effective tile installation, the water in your shower should wash away your troubles rather than adding to them. Categories: Installing tile and stone, Tile installation expertise, Tile Repair | Tags: Installation expertise, Plumbing leaks & tile, Quality tile install, Questions to ask a tile installer, shower pan leak, water management system | Permalink. Tile removal is very challenging and dusty work — especially if it’s a mud-set installation or one where there has been a long-time shower leak. Our crews prepare a site by papering any areas where they’ll be walking; putting up sheets of plastic as dust guards; wearing masks and gloves; using pneumatic scrapers; and carrying away all the debris. Categories: Ceramic tile, Tile Repair | Tags: bathroom renovation, tile demolition | Permalink.